is famous for founding experimental psychology, establishing the first experimental psychology laboratory, and training several generationsof important American and European psychologists. Wundt was born on August 16, 1832, in Neckarau, Germany. He was the youngestof four children born to a Lutheran minister and his wife. As a child, Wundtwas very lonely, and spent much of his time as a companion to a retarded boy.Wundt was an indifferent student who daydreamed a lot and earned poor grades. One school he attended suggested that he drop out and become a mailman. Heultimately graduated from high school, but with a poor record. He went to medical school at the University of Tübingen for a year but did not do well. After his father died, Wundt finally realized that he had to change his ways or he would not finish medical school. In an amazing turnaround, he enrolled at the medical school at Heidelberg, studied hard, received his M.D., and in 1855 received the highest scores in the state medical examinations. After graduation, Wundt studied at the University of Berlin, and then, in 1857, he became a lecturer in physiology at the University of Heidelberg. A yearlater, Hermann Helmholtz, the famous physiologist and physicist, came to Heidelberg, and Wundt worked as his lab assistant. From 1858 to 1862, Wundt published his theories of sense perception, the Beiträge zur Theorie derSinneswahrnehmung. Beginning in 1862, Wundt taught the first course in history about scientific psychology. Wundt's ideas are difficult to summarize because he was involved in so many areas, because he changed his views about many subjects in his 68 years of writing, and because his writing has no single, common theme. He was interestedin introspection, but he scorned the kind of introspection that involved vague, subjective thinking about thinking. Instead, Wundt focused some of his research on reaction times, the time it takes between the first impression of astimulus on a subject's senses and the subject's perceptions based on the stimulus. Wundt was also a great systematizer, creating a set of categories intowhich he could place his ideas about attention, stimuli, feelings, volition,impulses, memory, judgment, causality, and creativity. In 1871, Helmholtz stepped down as head of the physiology department at Heidelburg. He continued to write, and in 1873-1874 he published a ground-breakingtwo-volume book on the principles of physiological psychology, Grundzüge der physiologischen Psychologie. This book roughly outlined Wundt'ssystem of psychology. In 1875, Wundt became a professor at the University ofLeipzig where, in 1879, he established the first laboratory devoted to experimental psychology. Wundt remained at Leipzig until his retirement. He worked in his laboratory,published many books, and taught hundreds of students from Europe and the United States. By the end of his career, he had directed almost 200 doctoral dissertations. He was a fine lecturer, and people from around the world came toLeipzig to study under him. Many of the most famous psychologists of the early twentieth century were his students. 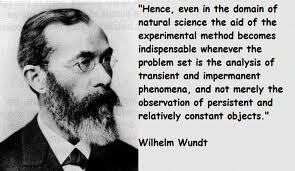 Although Wundt had many distinctions, he was felt to have many faults. He wasvery narrow-minded and dictatorial. He told his doctoral students what theywere to write on for their dissertations, and he was strongly opposed to child psychology, animal experimentation, and any practical applications of psychology. Wundt could be very scornful to psychologists who did not do things his way, and he often rejected new ideas that became very important in the history of psychology. By the end of his career, he had made his fair share of enemies, even though his psychological laboratory had many imitators and his books and lectures were much admired. Wundt retired in 1917, but continued writing until shortly before his death in Grossbothen, Germany, on August 31, 1920. By the time he died, this daydreamer who had been told to drop out of school and become a mailman had published 53,735 pages of scholarly research.